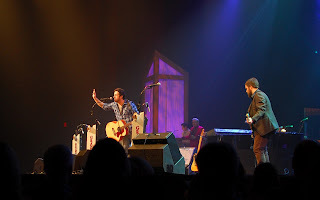 Will Hoge is a prolific country singer from Nashville. Here he's concluding a brief set at the Grand Ole Opry. The Opry is a weekly live radio presentation from a purpose-built auditorium in Nashville. It hosts a variety of country, bluegrass, and Americana acts at least twice a week, and has been going since 1925. It suffers from annoyingly frequent commercial pitches, but was still a wonderful peek into the tradition of American country music.